A new £1.5m footbridge across the A6 dual carriageway in Birstall, Leicester, is now officially open to the public. The 50 metre footbridge spans from the Hallam Fields estate to the Birstall Park & Ride site, with a new combined footway and cycleway providing an onward link to Cedars Academy. The final phase of works will see this footway and cycleway extended to the village of Wanlip. 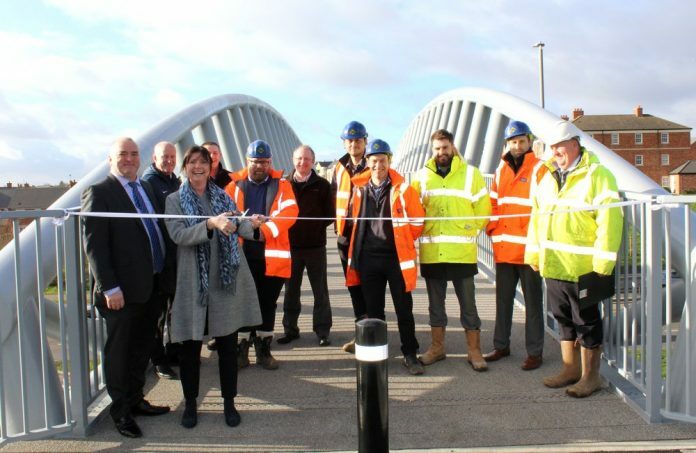 The scheme was constructed by Danaher & Walsh Civil Engineering following on from the success of other recent bridgeworks projects, including Leicester’s Charter Street Footbridge which opened 12 months previously. The Birstall scheme was funded by Leicestershire housebuilder Jelson Homes as part of their extensive Hallam Fields residential development. The bridge’s opening ceremony was attended by representatives from Cedars Academy, Danaher & Walsh, Jelson Homes, and design engineers William Saunders. In a brief speech, Danaher & Walsh Group’s Managing Director Dan Danaher thanked the entire project team for their hard work in achieving successful completion of the scheme. Marking the opening of the bridge, a ribbon was cut by Cedars Academy’s Executive Principal Laura Sanchez. Commenting on the significance of the bridge’s opening, Ms Sanchez said: “This bridge will make a massive difference to the local community, as well as the young people who attend Cedars Academy. Ann Carruthers, Director of Environment & Transport at Leicestershire County Council, added: “I’m delighted that the Birstall footbridge is officially open to the public.